Many homeowners may not be aware of it, but residential lawn maintenance services like mowing, trimming, weeding, fertilizing, and the like are not a form of luxury but a necessity. How so? Imagine having to do all these tasks yourself on weekends, when you should have been spending time with your family or attending to other more productive businesses. Aside from the said reason, availing of professional lawn maintenance services will also let you have better, healthier, and more attractive lawn. 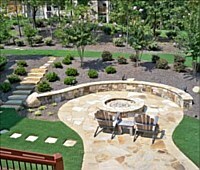 Luckily, you don’t have to go anywhere else to hire a landscaping offering such services. Here at Four Seasons Landscape Management, we have the tools and equipment required to handle every imaginable lawn maintenance task. Most importantly, we have skilled people who are adept at performing these specialized services. Fertilizing. We use only organic fertilizers whenever possible. This allows us to help keep healthy turf without harming the environment. If you’re a Green advocate, then you’ll surely love this feature. Weeding. Weeding is as much a requirement as fertilizing to ensure that the plants in your lawn will not wither and die. We have the necessary tools to handle all weeding tasks. Pest control. This is another important residential lawn maintenance task. Of course, who wants pest to take over your greens and create troubles for them? Definitely not you! As such, we have skilled workers who can contain any type of pest infestation to ensure the survival of your lawn’s stunning greens. Irrigation. The greens planted in your lawn needs to be nourished. Fortunately, our staff can install functional and effective irrigation systems to keep your plants, turf, and shrubs properly irrigated especially during summer. 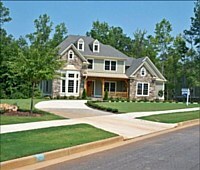 Residential lawn maintenance should not be performed for a single season alone. Instead, caring for your lawn should be an all year-long concern. And no company in Newnan or any other area in Georgia knows this better than us at Four Seasons Landscape Management. As such, we provide affordable, complete, and reliable lawn maintenance services whether it is winter, spring, summer, or fall. With our passion for providing satisfaction to every client that we serve, you are assured to get the positive results that you want for your lawn. So call us today or visit our office for your landscape maintenance needs!